For those not born within the sound of the bells of St. Mary - le - Bow, the complete phrase is: "Me old china plate - me mate." It's a Cockney phrase. When you refer to someone as "Your old china.." you are actually calling them your mate or friend - it loses a lot in translation, but it has a wonderful old country feel when rattled off by the barrow boys in Petticoat Lane or Portobello Road. My father, who was stationed in London during WWII, came home with lots of London expressions just like that. It was enriching. It reminds me of James Joyce who made up so many words and phrases because he felt that the English language was too narrow; it restricted so much of his creative expression. I am always amazed that editors give writers a list of words to stay within when they are writing books. How limiting. Does this happen in knitting design too? Certainly the larger yarn houses have to have patterns done in their yarn - a little restricting. I often tell designers - don't do crochet - it doesn't sell - another restriction - more on that later . Still there are some designers who never seem to be restricted. They can turn the simplest motif into that must have pattern. I promised you pictures of Sasha Kagan's patterns from china plates - there really was a method in my madness! - well here they are. 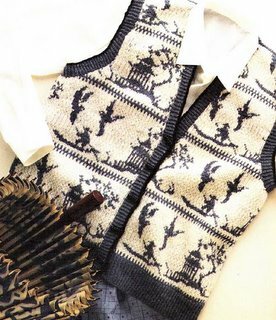 They can be found in her book - The Sasha Kagan Sweater Book - and there are kits available for a good number of the designs in the book, from Sasha's web site. Above is Willow from the classic blue willow pattern. At the left is Double Dutch from Delft pottery. Both just too delicious to resist! I think that Sasha has captured the fragility of china and pottery in the not so fragile medium of knitting. Still tiny stitches in fine yarn have their own delicate nature. We treasure our knitting as much as we treasure other keepsakes. Great designers seem to sense this double entendre. They enrich their work on many levels, reflecting in their patterns the richness of life! I would be delighted for you to post the 3 pictures of my designs on your weblog. 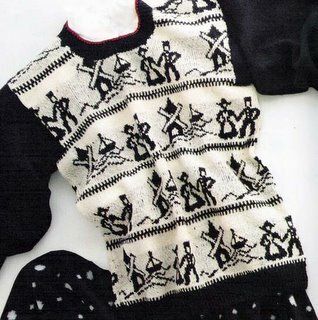 They are from "The Sasha Kagan Sweater Book" published by Dorling Kindersley in the UK and Ballantine in the USA ISBN 0-86318-051-5 first published in 1984. Please give this book info and point people to my website http://www.sashakagan.co.uk/. Signed copies of this vintage knitting book are available from my studio price £20 plus £3.50 p&p ($36 plus p&p $13.50) Original kits also available. 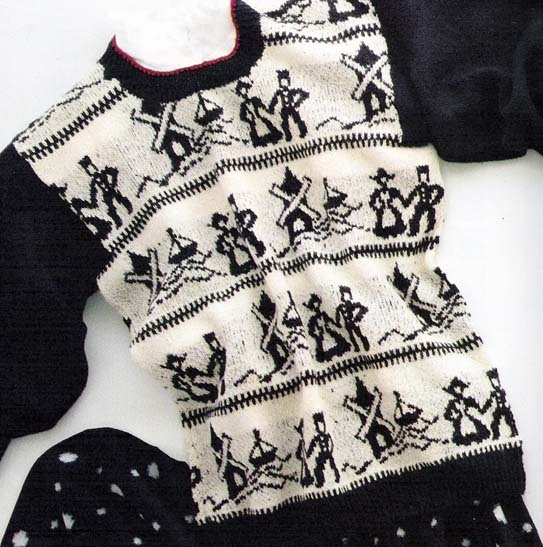 Knitters still send up for kits from this book even though it is 22 years old. The classic look does work! Thank you for your interest in my designs. Thank you Sasha for responding!!! Here is the third design that Sasha refers to. I knit it for my husband from Sasha's book mentioned above. This pattern is called - Copper Diamonds. It was worn with so much love, that it was worn out! (Hopefully not the love - just the sweater.) 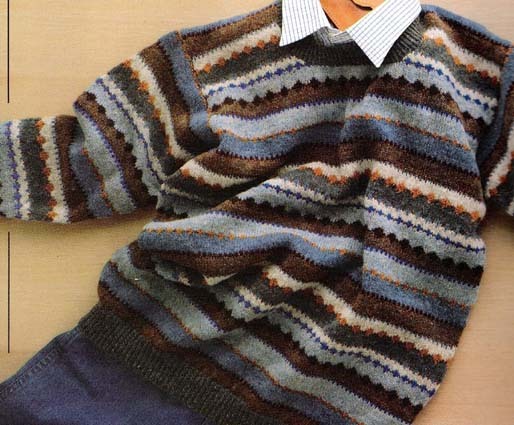 It was a joy to knit and a thrill to see worn almost daily. We knit so often for ourselves, but we love when the knitting is shared! !